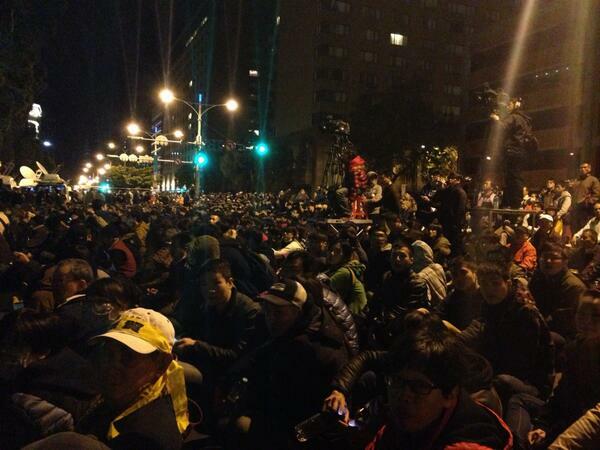 Taiwan protest scene, Monday 3 am outside the Executive Yuan. Photo via @austinramzy on Twitter. The truth is, many people don’t know much about the content of the service sectors trade pact with China, so they don’t know why people are opposing it. People no longer read about arguments online in support of the pact, nor would anyone dare to write more to advocate it. After all, it has become what political communication theory calls the Spiral of Silence. Whoever supports the pact is seen as betraying Taiwan and an idiot who will destroy his or her own employment prospects. But of course, there are also those who would ask: Does Ma Ying-jeou really dare to sell out Taiwan in broad daylight? Why does Ma Ying-jeou insists on signing a trade pact that is condemned all around? Simply put, the pact opens up mutual investment in service sectors between China and Taiwan. With the pact, the Taiwanese will be able to invest in more service sectors and establish operations in sectors such as hospitals, publishing, tutoring industry, banking and more. In return, China can also invest in similar sectors in Taiwan. For Taiwanese capitalists, the benefits no doubt overweigh the drawbacks. But for average Taiwanese, if they don’t mind that their top bosses are from China, there will be more employment opportunities. After all, when money pours in, jobs do too. Therefore, the service sectors trade pact is a good pact and mutually beneficial to China and Taiwan, right? Let me reiterate: for those Taiwanese who want to invest in China, the pact offers big benefits . Meanwhile, it’s not bad either to want to have abundant Chinese money invested in Taiwan, to buy our corporations and to create jobs, not to mention that China would open more to Taiwan than otherwise. So what we have is an unequal pact, unfair to China and generous to Taiwan. The article-by-article review requested by many really isn’t that meaningful at all, because each article is a part of the whole, and how can we pick only those we like and keep mum about the fact that they are opening up to us? So we should support such a pact? This is a difficult question to answer. But let’s try: how about we replace China with Japan or the US? For example, we passed the FTA with New Zealand without the public condemning it. But with this pact, why is the public so repulsed and unyielding? Because, China, I am afraid of you. Really, I’m am so afraid. Honestly, Taiwan will have no problem with passing a similar pact with a country other than China. Suppose Japan opens up to Taiwanese investment [in these sectors], Japan invests in Taiwan, filling our streets with Japanese, I for one, as a pro-Japan Taiwanese, will feel wonderful. But unless we are a territory, or a colony, of Japan, the Japanese will hold their ground without giving in one inch when negotiating with us, insisting on fairness and mutual benefits. But, as someone pointed out, the pact with China is perplexing in that China gives so much more to Taiwan than Taiwan gives to China. There is no free lunch in the world. From the point of view of economics, why is China giving up so much and letting Taiwan gain so much? Children, because of love of course. China loves you, and hopes to take you back to the motherland sooner than later. And to take you back, China of course must first of all control Taiwan’s economic lifelines. If one day, half of 7-Eleven and FamilyMart (小七 and 全家, two convenient store chains in TW) become Chinese investments, Pxmart and Wellcome (全聯 and 頂好, two supermarket chains in TW) are sold to mainland Chinese, and Taiwan Taxi (台灣大車隊, a taxi company) is renamed China Taxi; if in the future, when you go to the bank, your financial records will be sent to headquarters in Beijing; if Cathay General Hospital and Chang Gung Hospital (國泰醫院 and長庚醫院) are renamed China Cathay General Hospital and China Chang Gung Hospital respectively, and the hospital and its departments are all headed by people sent from China, can we accept that? Realistically, the Taiwanese corporations that are capable of investing in China’s banking, hospitals, printing and taxi industries have to be big conglomerates, so the money will be made only by the Cais, Wangs, Guos (Taiwanese tycoons), not you and me. For Chinese corporations to invest in Taiwan, the capital needed is like one hair to a cow, and these Chinese corporations are deeply tied to China’s political system. If one of these days, when Taiwan wants to hold a referendum [on independence], and 7-Eleven announces a suspension of its operations, China Taxi decides not to run the taxies, our credit card records and medical records are all in the headquarters in Beijing, China, will we be able to hold the referendum or not, I ask? Don’t tell me this will not happen. Look at Tsai Eng-meng (蔡衍明)’s Want Want Group, look at how it has changed the China Times (《中國時報》) founded by Mr. Yu? I would say, these days the People’s Daily is probably a more interesting read than Want Want’s Want China Times. The Chinese former leader Deng Xiaoping and the US president Ronald Reagan once talked about the freedom of movement. Reagan complained about the Chinese’s lack of freedom to travel abroad. Deng Xiaoping said offhandedly, no problem, we can send 1 billion Chinese to the US for sightseeing and to enjoy freedom. Reagan didn’t bring up the topic again. Investment with free capital flow is the best thing that a service trade pact can bring us, but just not with China that tries to encroach on Taiwan through commerce. I would be very happy to accept such a trade pact with a democratized China that treats Taiwan equally without attempting to annex us. Capital flows into Taiwanese industries and revitalizes our economy, high-quality Chinese managers come to Taiwan to live and consume, while our capitalists invest in a democratic China where they make money as an equal in a society with rule of law and bring their money back to Taiwan, wouldn’t that be wonderful? But please tell me, the nation, what do we do if China one day announces the withdrawal of all the investment? What do we do if China foregoes the agreement and terminates Taiwanese businesses’ favored status in the name of the anti-secession law? What do we do when Taiwanese investment in China is like a clay-made ox disappearing into a sea while Chinese investment in Taiwan is like thunder and storms raining down? What do we do when these things happen that won’t happen if the pact were with a democratic country? Would you like to be subdued? I wouldn’t. I’m very afraid, because I know I will have to embrace tears. The Tea Leaf Nation translated an excerpt of the same article. By China Change in Analyses and Opinions, Taiwan on March 23, 2014 .